I've been in the face and body painting business for 20 years now. I still have so much to learn! I'm determined NOT to settle on thinking that I'm the best at anything...I always have something to improve upon and learn, and hope to keep it that way as long as I'm around! 17 years into it I felt that I had pretty well mastered cheek art, so I thought I'd finally branch out into the world of full face designs. (Yeah, I know...took me long enough, right?!) The art of face painting has really grown drastically over the years and I didn't want to be left behind! I still remain a huge advocate of the benefits of offering cheek art, strive to help others learn how to do cheek art just as amazing AND fast, and even run a cheek art face painting group on Facebook. Cheek art still remains the #1 request at my county fair. However, I am always trying new techniques and tips, and had to give full faces a try. In 2011 I began offering full faces in my pay-per-face county fair booth, along with my cheek art! Now that I look back on the photos I had put on my design menu, I can really say I've come a long way! I have a LONG ways to go and have learned so much from my peers. 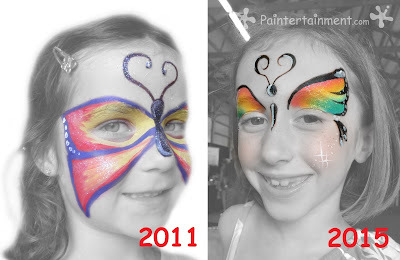 Heck, before Facebook came along I really had no idea how far face painting had come and could go!! Butterflies and tigers are still my nemesis! I used to try to cover the whole face with butterflies that just looked awkward. I have since lightened them up a bit, and I think they look better. I still am not happy with my butterflies' bodies and antennae, but hey, we all have stuff to keep improving, right?! I actually put that one on the left on my banner. MY BANNER!! 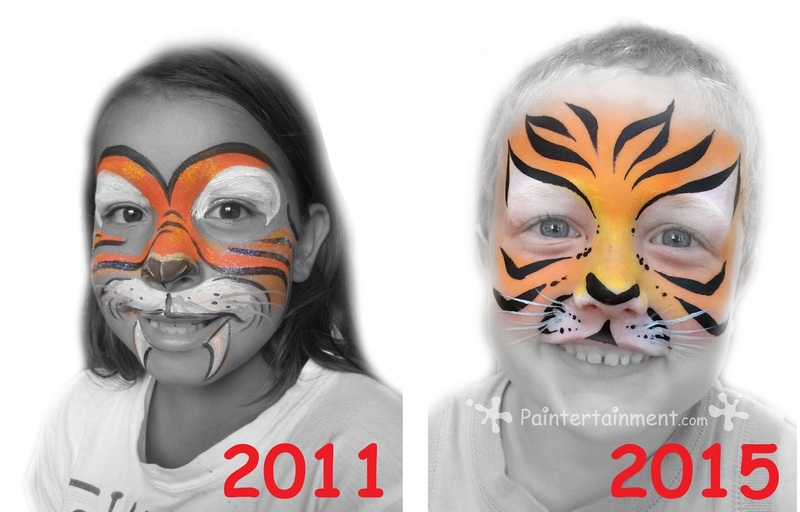 Ugh, bless the heart of this little girl who loved her tiger, but oh my, I'm so much better now! Tigers are SO tough for me and I'm still working on them to this day! This one on the right I just did a few weeks ago on my little boy...also still new to Starblends which I used for the base! 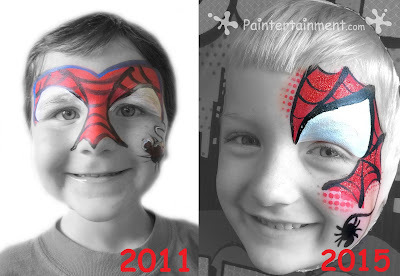 My first full face spidey on the left..today's Spidey on the right with a little extra "pop" of graffiti eyes stencils! I still have a LOT to learn and improve upon with my full faces and will probably never look at a picture of my work without critiquing myself!! But I think the desire to keep improving is what makes artists great. My drive to learn and improve has pushed me to learn and now offer balloon twisting and henna body art as well, and those have been some incredibly fun learning experiences!! Are you stuck in a full face rut and frustrated with cheek art? Practice it!! Are you stuck in a cheek art rut and frustrated with full faces? Practice them!! Maybe you'll find they're not you're thing, but the journey of trying and stretching yourself will teach you so much that can only improve your work! Stretching yourself can be tough because it means admitting that you are not the best; that you have room to grow. My hope is that I never settle on my talents as they are...that I will continue to make myself learn and grow. Sure, along the way I may find that the latest technique is not for me, but at least I can say I've tried it and can speak from actual experience. That's all people really want to hear about anyway, right? 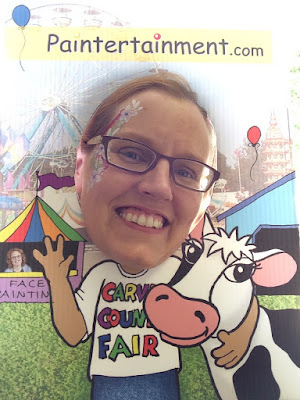 Last week I tucked my 18th county fair under my belt...this being my 3rd year at Carver County Fair! 2015 was a great year and I thoroughly enjoyed painting so many adorable faces!!! If you're coming to this post via my Pinterest pin on cheek art, scroll down for a bunch more! 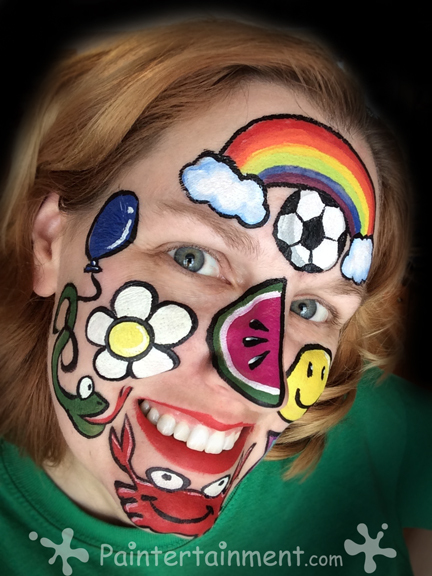 If you're interested in learning to do simple, quick cheek art yourself, be sure to check out my book, "Classic Carnival Cheek Art! 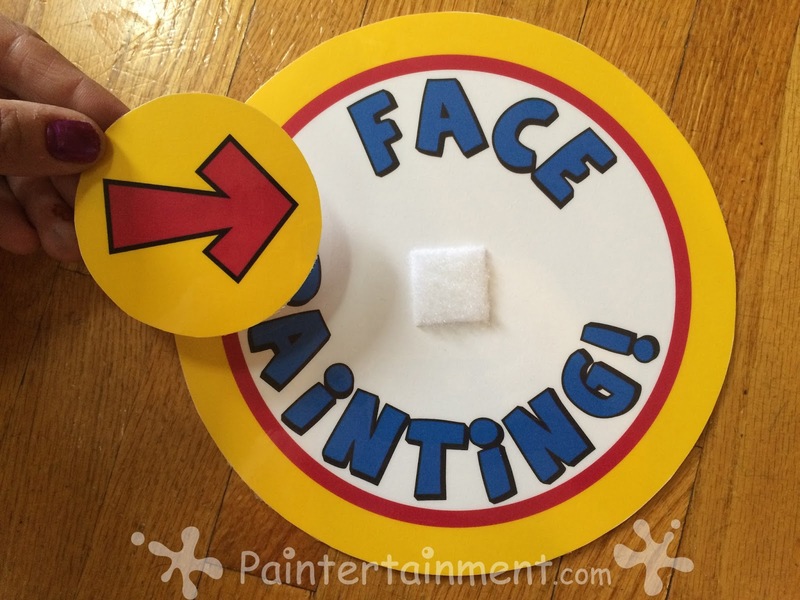 We also have package deals for those new to face painting that include everything you need to get started, and an awesome page of FREE learning resources! Click here for my book, "Classic Carnival Cheek Art!" The fair starts on Wednesday, and this year I loaded up my booth and boys and we set up Tuesday morning. 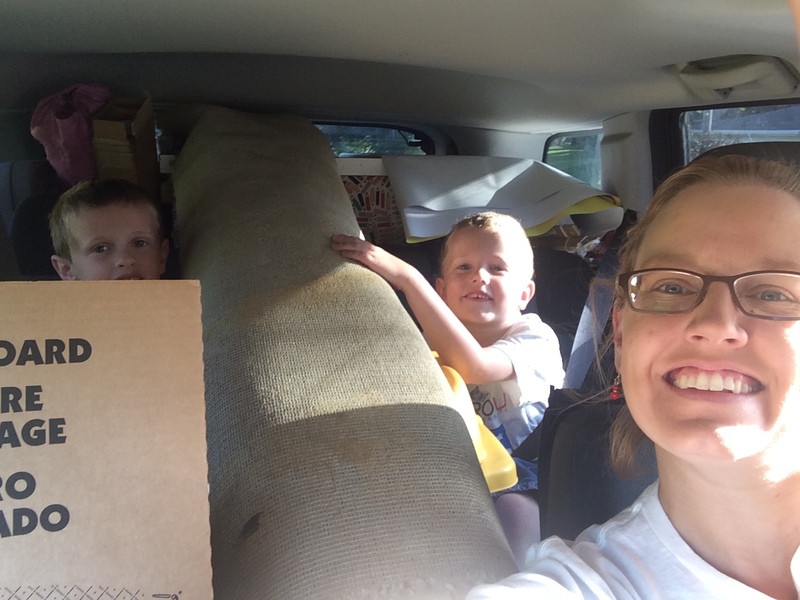 All packed in and heading to the fair! The boys are just excited to play games on my iPod and iPad while I set up. You can tell they never play video games in our house, only on trips and in waiting rooms, ha! But they were thoroughly entertained! I keep telling them someday they'll be taller than me and will have big muscles to help Mommy load and unload my booth! The booth all set up and running! This was taken on the last day when my hubby and boys came to visit me! I always want my booth looking as sharp on the last day as it does the first. I do a lot of cleaning every night and when I have time between paintings! This is the view when walking into the building of where I work. 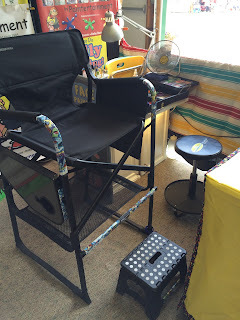 I had a totally new setup this year with my chairs. I now do most of my parties standing up with kids in this tall director's chair! However, my back and feet wouldn't be able to take multiple 12 hour days standing up. 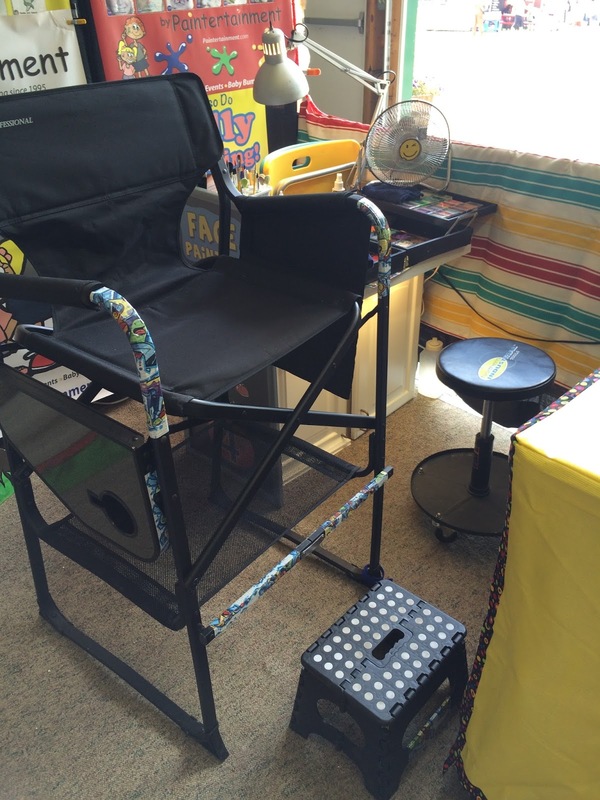 So, I decided to bring along my hydraulic stool that I use when I do belly paintings. It worked great! The kids got to sit up high and feel like royalty, and I had the option to sit or stand depending on how I felt and how tall the kids were. Me trying out the county fair board! A popular ice princess design!! 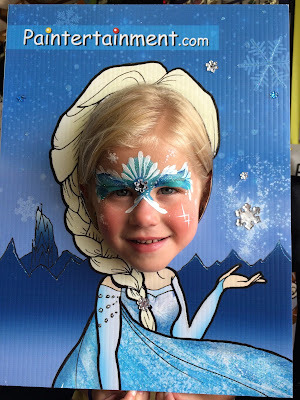 A few booths down they had cardboard cutouts of Anna, Elsa and Olaf to take photos by too which was fun for the kids! 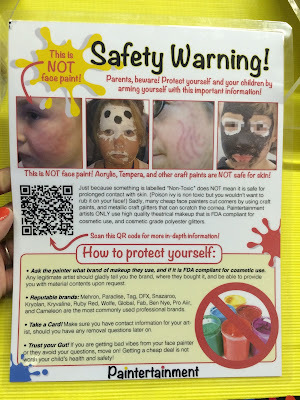 Also new this year was this small safety information sheet I had out on the table, educating parents on what to watch out for when allowing their children to be painted. 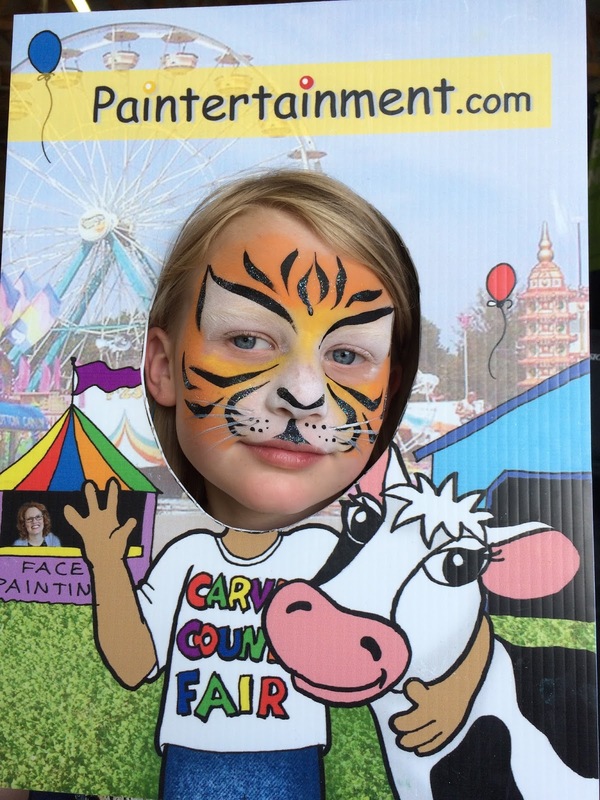 It's really shocking how many events offer free face painting that is not face paint at all, but tempera, acrylic, and other unsafe craft paints & glitter. Click here for my in-depth article on why "non-toxic" paint is NOT safe for skin. I had so many parents thank me for this information! There was another person painting at the fair this year with questionable paints in jars, and more than once I was asked by the parent to wipe it off and paint something else before they even saw this flyer. Unfortunately whatever it was stained badly. 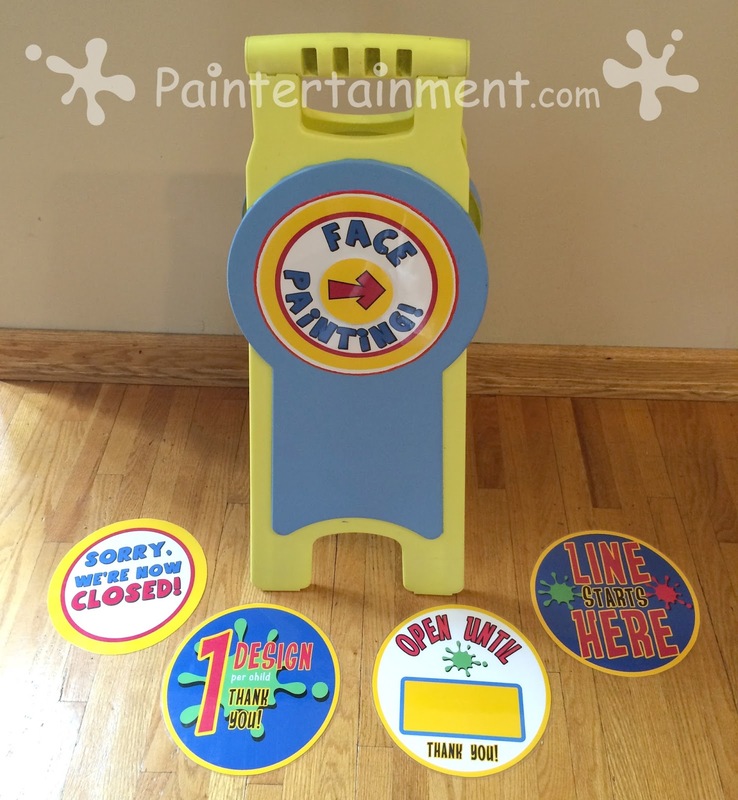 Safe face paints can stain too, depending on your body chemistry and the colors of the paint. Some brands' blues and greens stain more, etc. You can see my analysis of what professional brands stain the most/least here. If you ever have this happen, at least if it is face paint, try applying a little lotion to the skin. Wait 20-30 minutes and then try washing again. Usually this helps to release the paint. Do NOT ever clean face paint off with baby wipes! 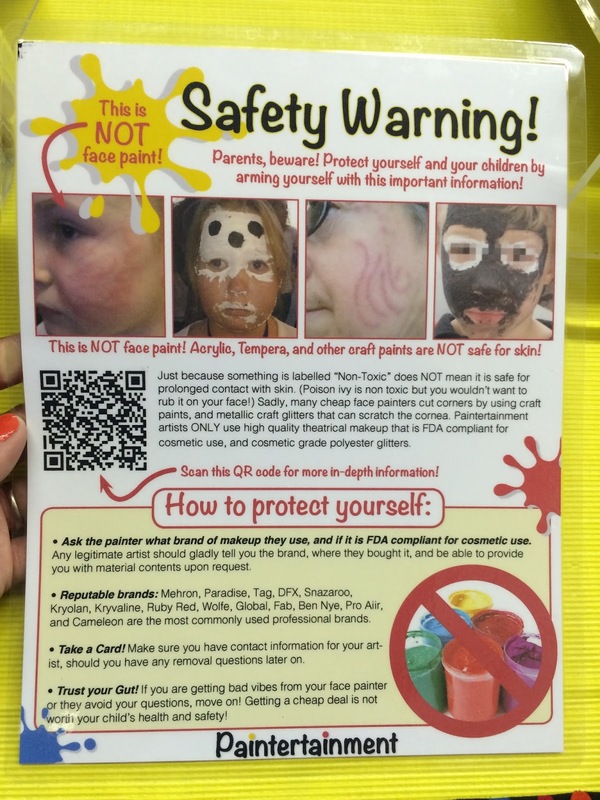 They have been known to cause awful reactions on kids' faces no matter what type of paint is used. I tell people to remove with a gentle soap and water. The best way is to lather it up with liquid soap (BEFORE getting it wet), loosen up the paint, and then rinse with water. 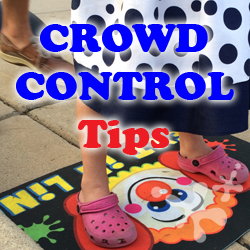 This is the best way to prevent staining during removal. Also new this year was basically my entire paint kit. My kit changes frequently but this year it grew so much, I've outgrown my countertop! Time to make a few modifications for next year! A few of the designs I did this year... Cheek art still remains one of the most requested forms of painting for me. And, being one of the very few artists in the Twin Cities who is faster at cheeks than full faces, I still am able to do them and offer them for less than full faces. However, in general, most painters prefer doing full faces as cheek art requires a lot of precision in a small space with little to no room for error, which takes longer. For now, I'll keep offering it as people love it and I'm convinced it can be just as awesome!! 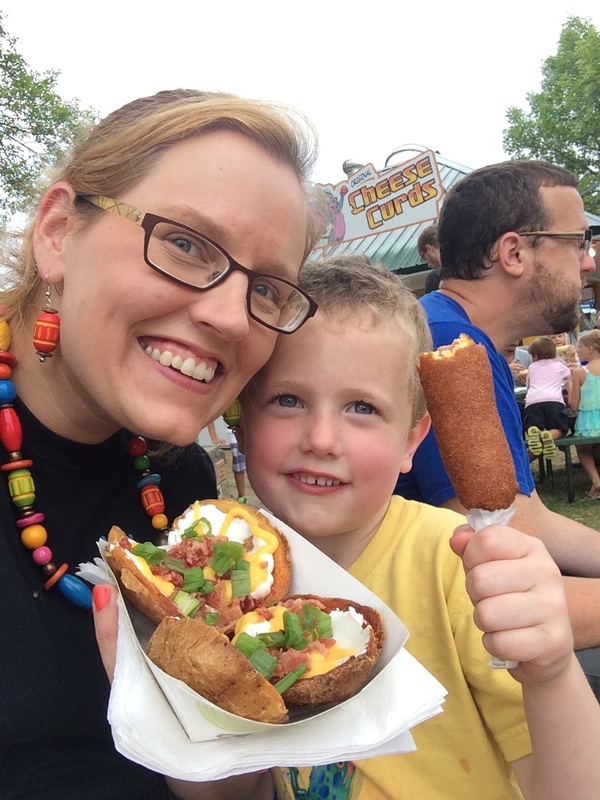 It also works well at the fair when kids faces are often carrying the remnants of all that good, greasy, sticky fair food!! ;-) I paint a LOT of arms, too. Sometimes kids ask for their hands. 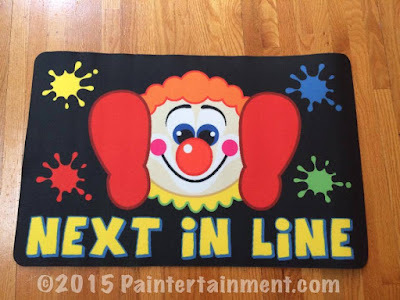 Usually I then suggest just above their wrist...that way they can still wash hands after petting the animals and eating cotton candy without losing their artwork. But, I've been doing a lot of full face, half face, and eye designs these past few years and they are very popular! These two friends wanted to split a design, literally! Gotta love it when someone dares their friends to get painted, and they actually go through with it! My mom painted at the booth on Thursday so I could visit with my boys! Thursday night we had a storm roll through and were told we could close up early! These are the days I love being in a building, versus a tent outside! Quick roses, done with Global Hobart. Love that cake! This was my most detailed arm design for this year...Inside Out! Love that movie!! Closeup of "Sadness" and "Anger"
I did this little design to go along with the henna I had already done on my hand! Big thanks to all of you who stopped by my booth this year and made it my best year ever! See you in 2016! !